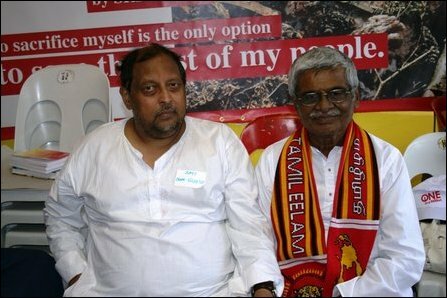 M.K.Eelaventhan, a former Tamil National Alliance (TNA) Member of Parliament in Sri Lanka. Tamil National Alliance member and former Sri Lankan MP Mr. M. K. Eelaventhan, now on the second day of his hunger strike at the Shree Mariamman Temple in Mount Edgecombe, is determined to continue until his demands from the international community are met. Mr Eelaventhan has been in politics for sixty years, fighting for recognition of the political aspirations of the Tamils in Sri Lanka. He is disillusioned that following the conventional political channels all this time has brought no effective solution. “If the Sri Lankan government feels it needs to resort to violence to resolve a political issue instead of using political means, it is time we also pursued alternate methods of attaining our aims. That is why I have embarked on this strike.” He wants to gain the support of powerful political figures here in South Africa like Nelson Mandela, Archbishop Desmond Tutu and Jacob Zuma in ensuring his demands are met. The most urgent of his demands is that the international community demands an immediate and permanent ceasefire from the Sri Lankan government. He is also calling for humanitarian aid, supervised by INGO’s, to be allowed to reach the Tamil people affected by the war. He asks that local and international NGO’s be granted unrestricted access to the detention camps. The last and perhaps most pivotal of his demands in terms of reaching a permanent political solution is that peace talks are resumed with the Liberation Tigers of Tamil Eelam who are the sole representatives of the Tamil people. These same demands are being made by Tamil diaspora across the globe. Protesters are coming together in their thousands across Europe, Canada and Asia all demanding a ceasefire, aid and peace talks. Two Tamil students in the U.K. have been on a hunger strike in London’s Parliament Square since Monday. Mr. Eelaventhan has received the well wishes and blessings of the thousands of devotees at the Shree Emperumal Mariamman Temple where he is staging his hunger strike. He urges the likeminded Tamil Diaspora or concerned human rights activists to join him simultaneously in this effort. 07.04.09 'It is not the way for post-conflict ambitions,' s..
07.04.09 No more excuses in waging the war - Protestors in ..